Lydia Giomi's game stats are impressive. 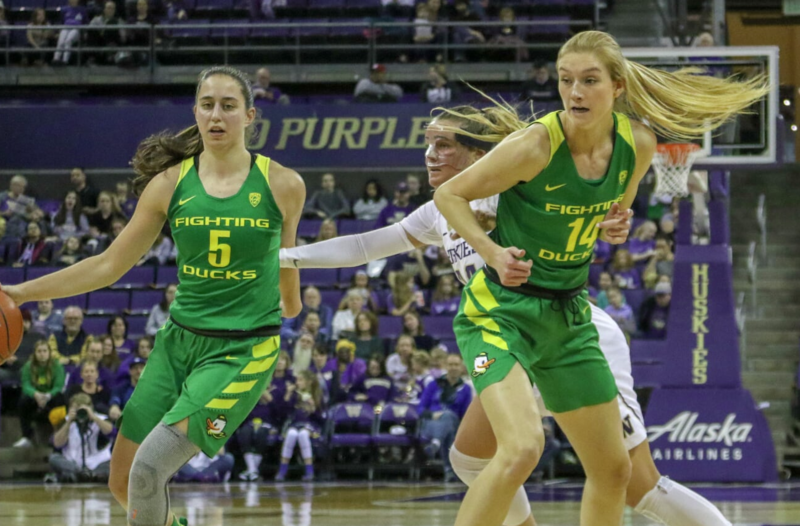 West Seattle graduate Lydia Giomi is receiving more playing time this year as a sophomore with the University of Oregon women’s basketball team. Giomi, who put in appearance in Seattle when the Ducks visited the University of Washington team Jan. 27, is averaging 10 minutes of action over 23 games. The 6-foot, 6-inch Giomi is averaging 2.0 points and 2.4 rebounds with a total of four assists. Thomas Jefferson graduate Tony Barnette has signed on to pitch for the Chicago Cubs after leaving the Texas Rangers as a free agent. Barnette was limited in his playing time for the Rangers last year by injury but posted a 2-0 record with a 2.39 ERA over 26.1 innings of work as a right-handed reliever. Barnette struck out 26 batters and walked only five. Reports out of Green Bay are that Kennedy Catholic High School and Washington State University graduate Cole Madison may not play football again because of personal issues stemming from the suicide death of Cougar teammate Tyler Hilinski. Madison was drafted by the Packers out of WSU last spring and attended one camp but never reported for the regular preseason camp or during the season. Green Bay retains the rights to the offensive lineman if he chooses to play this year. West Seattle senior standout Abdul Mohamed has signed a letter of intent to play basketball for Eastern Washington University. West Seattle graduate Nate Pryor is now playing for North Idaho College after originally signing on with the University of Washington team out of high school. Pryor is a 6-3 freshman forward for the No. 1-ranked Cardinals of the two-year schools NWAC. He did not play for the Huskies last winter. Ballard graduate Adrianna Davis is in her sophomore season as a 5-4 guard with the Pacific Lutheran University women’s basketball team. Davis has played in six games for the Lutes, averaging 1.2 points and 0.7 rebounds with a total of seven assists. Mount Rainier graduate and West Seattle resident Brittany McPhee took home the Coaches Award for the Perth Lynx of the professional Women’s National Basketball League in Australia for the 2018-19 season. McPhee averaged 13.61 points and 6.87 rebounds in her first year Down Under coming out of Stanford University. She also averaged 1.83 assists. McPhee swished in 32 points in an early season victory over the Townsville Fire. Kennedy graduate and West Seattle product Vince McCluskey has two goals and two assists for the Tacoma Stars professional indoor soccer team. Please contact us at sports@robinsonnews.com if you have information for Keeping Track.